There was a time, not so very long ago, when I would talk about Canadian wine with people and the first thing out of their mouths would be, “Oh, ya, right…Icewine!”. It was this at this early point in the conversations that I would clench my teeth, take a deep breath, adopt my best Professional Smile, and exasperatedly exhale. I don’t get so worked up about it anymore – times are changing and the world is slowly becoming attuned to the many styles of magical liquid we’re making “up here.” This, in large part, is due to a firm commitment to quality, education, dedication and the influence of winemakers who have come to Canada from around the world to make wine here. Icewine proudly remains a large part of that magical process. Syrah block at Tantalus, destined to become Icewine. A “Happy Accident”. My knickers got twisted recently, though, when I heard about the “earliest Icewine harvest in over 25 years” this past November. Was this a Valley-wide phenomenon? I was bewildered; yes, our idyllic, colourful, and warm Autumn had been abruptly halted with an unseasonable cold snap and early snow. Temperatures plummeted in the Okanagan and we were somewhat caught unawares. But, had the Icewine Harvest of 2017 really begun in earnest? Had it really been cold enough, for long enough, everywhere to harvest and press and ferment Icewine in the Okanagan as had been rumoured? Dubious, I thought, and I needed the truth. Questions about Icewine are common on our wine tours – again, it’s what we first became known for and guests frequently ask about what it is. Before I relate my Anderson Cooper-esque conquest for the truth, let’s do a little Icewine 101. Icewine is a sweet, dessert-style wine made from grapes that have been frozen while still on the vine; the frozen grapes must be picked and pressed at a consistent temperature of -8C. The residual sugars in the wine when bottling cannot be less than 100 grams per litre, which much come only from the natural sugars in the grapes—adding sugar before or after fermentation is not allowed. Further, the Brix (sugar content per 100ml) in the frozen grapes and the pressed juice must be at a minimum 35 °Brix. Icewine from BC can only be made from specific vitis vinifera or Vidal Blanc grapes—while most commonly made from Riesling or Vidal here in BC, some are made from other varietals, such as Syrah, Cabernet Franc, and Tempranillo . All of this is strictly regulated, with producers adhering to these guidelines, as well as registration of their intent to make Icewine and a taste assessment process prior to marketing their product as Icewine. As for retail, Icewine tends to be more expensive for some basic reasons. Not only does it take a lot of work in the freezing cold to make Icewine, the amount of juice yielded from pressing frozen grapes is literally a drop in the bucket compared to grapes harvested while still they’re ripe and fresh. That’s a lot of shivering, a lot of squeeze, and not a lot of juice. Ergo: economics dictate a higher value. There are more regulations and technical terms to considered on the production end, but the most basic point to remember is the consistent temperature of -8C while picking and pressing. This is where my journalistic integrity in reporting hard-hitting news like the Icewine Harvest of 2017 kicked into overdrive. Anderson Cooper suddenly became my Spirit Animal. A crisp, pleasant late-Autumn day in November, well above freezing. Thankfully. 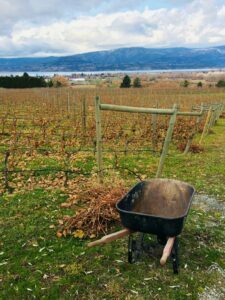 The purported Great Freeze of 2017 had passed, and it was a beautiful and crisp late-Autumn day when I drove up to East Kelowna to speak with David Paterson, GM and Winemaker at Tantalus Vineyards. I was eager to find out if everyone had harvested so early, as well as discussing this year’s Icewine harvest in general. I was also curious about how Tantalus Vineyards monitors the weather at their growing sites, and how the freeze-thaw cycle may affect this vintage. 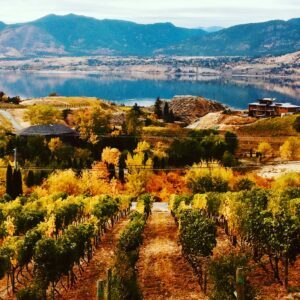 Tantalus is widely known for producing the varietals that perform best in the Central Okanagan: Riesling, Chardonnay, and Pinot Noir. (Their Riesling, some of which comes from 40 year old vines, is a personal favourite. See: Riesling for Living). As for Icewine, they’ve been producing it every year since their inception in 2005, at first only from Riesling. After discovering that a block of their Syrah vines were planted in a less-than-optimal location, the decision was made to produce Syrah Icewine from this fruit as well. Tantalus now annually produces both Riesling and Syrah Icewine, each delivering ethereal and musical flavour profiles that showcase the uniqueness of each year. Once at the vineyard, I noticed that the fruit at Tantalus was still on the vine—at least part of the mystery was solved. I heard about some producers harvesting this year’s Icewine, and yet Tantalus hadn’t. So: about that thermometer reading. Noting that each harvesting site is very different, and can be subject to its own weather based on its location in the Valley and proximity to the lake, Mr. Paterson stressed that he monitors the weather conditions at Tantalus with intense scrutiny. “The first early freeze maybe touched -8C. Maybe. But I know that our site was at it’s coldest -7.6C. That’s not -8C,” said Paterson. He added that, while -8C may have been achieved at certain sites in our region, he wondered how long that temperature was sustained. Why this is relevant relates to the time it takes to rouse a picking crew from slumber in the dead of night, assemble the crew on site, harvest the grapes, press the grapes, and ready the juice for ferment. For his part, Paterson prefers to harvest at -11C or colder to ensure he and his crew have enough time to get the job done according to the BC VQA guidelines. “They may have had -8C or a bit colder up north or at other locations, but we didn’t hit it here. At least not at our site,” he stated. Hearkening back to the intense set of regulations for Icewine set out by BC VQA, David added a very salient point. “Our wines are meant to reflect authenticity of place. High acidity in the fruit on this site, combined with the cryo-concentration of sugars when freezing, equals balance.” It’s the reference to authenticity which really resonated with me, something about the commitment to not diluting something so special that our wine professionals have worked so hard to create, promote, and maintain. So, I wondered, since the grapes at this particular site had yet to be harvested, what’s the difference in the end product when picking grapes during an early sustained -8C freeze, as opposed to having them subject to a temperature rollercoaster? As for grapes that are left on longer, the freeze-thaw cycle results in a more complex flavour profile. Downy mildew or sour rot affect the fruit, Paterson explained, which leads to more nuanced and complicated flavours, with more depth. This, he says, is what we’re in store for this year. In the end, I felt satisfied after my jaunt over to East Kelowna. Not in a self-righteous kind of way, but I came away enlightened, humbled, and feeling at peace with Icewine in general. Like, when someone gets really famous for something they did “that one time” and the pure mention of it elicits an audible eye-roll and a gag reflex…but then they pull off this incredible redemption project and it becomes part of this multi-faceted, intriguing and valued accumulation of their life’s work. Like Justin Timberlake. Or Vanessa Williams. Or Chelsea Handler. Or Rob Lowe. Or Van Gogh. Because, in the end, a commitment to integrity and authenticity gains the respect and admiration of those who follow. Autumn, as it was before Winter ruined everything. At least we’ll have Icewine! “What is disappointing is when some producing under the Icewine banner don’t follow the rules as closely,” Paterson said flatly. It’s a bold statement, but it really got to the heart of what was bothering me in the first place. As a proud supporter, promoter, and consumer of BC wine, it drives me particularly around the bend when there are public misconceptions about what it is we make here, especially when fuelled by speculation brought about by media. 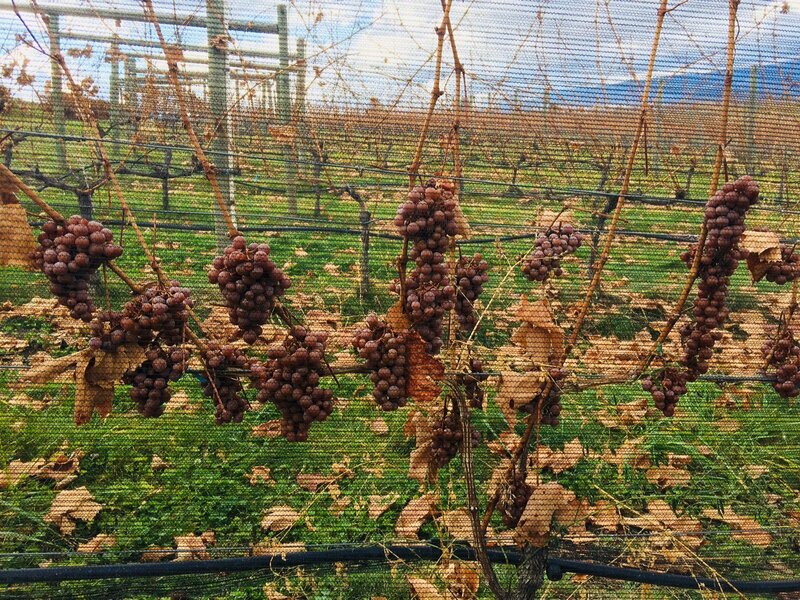 While it seemed that some locations in the Valley may have felt the saccharine kiss of Winter to warrant an early Icewine harvest, the overall Okanagan Icewine Harvest of 2017 has yet to commence*. But, in the words of Ned Stark of Winterfell: Winter Is Coming. And I can’t wait to be treated to what songs this Icewine vintage has to sing. *UPDATE: As of 8am on December 23, 2017, the Icewine Harvest at Tantalus Vineyards was completed at a comfortable and steady temperature below -8C. Kris was pleased to be part of this year’s crew.